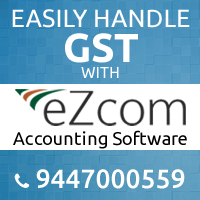 eZcom is a very powerful accounting software which is now a GST Ready Software developed by ipsr solutions ltd. based in Kerala,India. Our software is highly accurate and its simple bookkeeping system is perfect for traders and small businesses. People who are specialised in supermarket, textile shop, electronic shop, distribution business, electrical shop, hardware and sanitary shop, hotels, small scale industries etc. are widely using eZcom sincs the past 14 years. The latest version of this software helps you to handle GST Tax returns with utmost easiness. eZcom will save your time and money by virtue of its simplicity accuracy and valuable output.